How Are Slabs Poured In The Home Construction Process? The pouring of the slab is a critical step for your new home. It is said that a house built upon the rock will endure, this is your rock. Some very skilled laborers poured this slab, and the garage slab in a single day. The slab is reinforced with concrete rods and mesh that helps keep a cohesive bond along such a large surface. After the concrete is poured, the laborers use special tools to ensure an even and level surface. They then cut “expansion joints” or small lines in the concrete at set points, that will shatter at controlled points should the concrete move or swell. We had the luck of a small amount of rain two days in to the curing process (drying) that allowed us to see just how even the surface is. The skilled contractors Ryland brought in did a fantastic job, as there were no pools or standing water on the entire slab. The total cure time allowed for the slab was five full days. One of the most vital steps in the home construction process is the foundation of the building. Your foundation should be leveled, consistent and in accordance with the local building code. 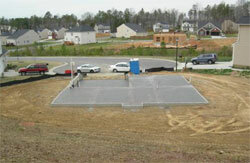 The most common material for constructing your foundation is concrete materials. The walls of your foundation can be poured or built with cement blocks. A 4-inch thick concrete slab is then poured for the floor of your basement. Stability of your home depends largely on the type of construction materials that you use. Always bear in mind that your foundation carries the entire weight of the house. In addition to this, it is also the basis to determine the exact dimension of your home. The homeowner himself can construct the foundation, but if you want to make sure that you are doing the right thing, it would be best to leave everything to a reputable foundation contractor. If you chose to try to do the work yourself, here are some helpful steps to assist you. 1. Take note of the tools that you will need for your foundation project. Always be ready with your measuring tape, slab frames, wood saw, cement, iron bars and the like. Before starting, you should take the exact measurement of the area so you know the size of the frame boards needed. Afterwards, cut the board and make a square frame. 2. Properly level the ground before you place the board underneath. If there are uneven spots on the ground, it would be best to use the shovel to make it flat. The measurement of the trench should be 8 inches in width and 4 inches in depth and the same should surround the perimeter of your frame. The idea here is for the external slab foundation to be thicker in order to achieve the desired strength and stability for your building construction. 3. Use a mixer to combine the concrete and water. The mixed substance should be as thick as mud. Read the instructions well so that you know the exact quantity of cement and water which should be used. Pour three inches mixture into the frame and use the rebar to add more strength. Fill the remaining frame with concrete. Smooth the concrete with a screed or board. The best way to pour the mixture is to do it slowly so that the inner portion of the slab will be level. 4. After you have leveled the top of the concrete, you should let it dry until water starts to appear on the surface. Use a finishing tool or mason's trowel to finish the slab. Let the concrete cure for at least three days. Remove the framing forms. There are instances when the frame cannot be easily detached especially when the concrete has dried up. You could use a lubricant spray to make the job easier. 5. If you do not want to do the mixing yourself, you could also buy pre-mixed cement. Most homebuilders make use of this type of construction material because of the strength it provides especially on the walls of your home. However, you should avoid purchasing soil cement with clay content because it is a very weak mixture. It is imperative that you always refer to the building codes before anything else. Get in touch with the National Association of Home Builders because they can give you some tips and guidelines on how to construct a perfect slab foundation. You can also check with your local building inspector to make sure you are completing the job correctly and to avoid any future problems.